In August 2011, ΔΒ Chapter alumnus Bart Tripoli '04 organized a group of alumni who were unsatisfied with the lack of opportunities for chapter alumni to get together. To help solve that problem, the Jersey Shore Alumni Club was reactivated with Bart serving as the President of the club. He is joined on the Executive Committee by Kevin Phelan '04, Vice President; Jeremy Victor '15, Treasurer; David Schwartz '06, Secretary; and Mark Covello '11, Event Chairman. Members of Mark's Event Committee include Steve Colvell '03, Brett Stevens '08, and Anthony Zurica '01. 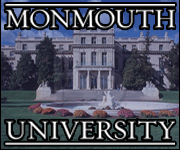 The Jersey Shore Alumni Club has organized several successful events including trips to Citi Field, local bar nights, and alumni tailgates at Monmouth University football games. If you are an alumnus of the ΔΒ Chapter or live in the northern Jersey Shore area and you are interested in attending an event or helping to plan an event, please contact Bart via e-mail at bocie5970 [at] aol [dot] com. ΣΠ Fraternity requires that each chapter have a functioning Alumni Advisory Board. 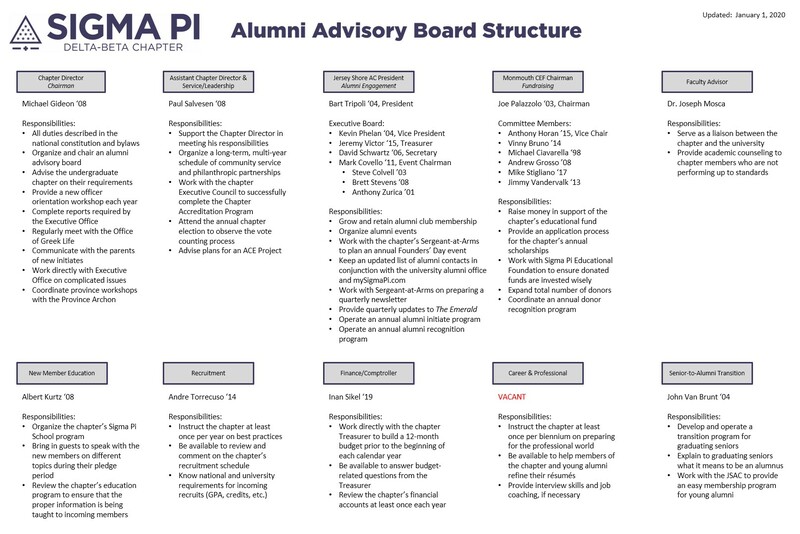 The members and positions of the ΔΒ Chapter Alumni Advisory Board are listed below. You can click the image for a larger view. In December 2005, several ΔΒ Chapter alumni donated some funds to create a specific ΔΒ Chapter Scholarship Fund at the Sigma Pi Educational Foundation. This fund was changed to a Chapter Educational Fund (CEF) in April 2010. This change required a committee of chapter alumni to be created with the duty to create fundraising events, increase promotional efforts, and submit grant requests to the fund. The members of the committee are: Joseph V. Palazzolo '03, Chairman; Vinny Bruno '14, Bryan Duarte '14, Bill Foley '06, Andrew Grosso '08, Anthony Horan '15, and Jimmy Vandervalk '13. Thus far, the ΔΒ Chapter CEF has been used to award annual scholarships to undergraduate members of the chapter, pay for travel and registration costs associated with attending national events, and pay for costs associated with hosting local educational workshops on Monmouth University's campus. Future plans for the ΔΒ Chapter CEF include increasing the dollar amount and number of annual scholarships available for undergraduates, creating a graduate-level scholarship for ΔΒ Chapter members, and potentially using the fund to help create a Brotherhood Hall for use by undergraduate and alumni members of the ΔΒ Chapter. If you are interested in making a 100% tax-deductible donation to the ΔΒ Chapter CEF, you have several options. First, you can use the form at this link to make an online donation. You'll need to click on "Make a Donation to the Educational Foundation" and then please remember to select the "Chapter Educational Fund: Monmouth (Delta-Beta)" campaign from the first drop down menu! Second, you can make out a check to the "Sigma Pi Educational Foundation" and send it to 106 North Castle Heights Avenue, Lebanon, TN 37087. If you opt to send a check, be sure to put "ΔΒ Chapter CEF" in the memo so your donation goes to the right place! If you would like more information about the ΔΒ Chapter CEF, please contact Joe via e-mail at joe [at] sigmapi [dot] com.